Marvin could be called the $2,000 cat. He had some steep medical bills in the past. His family left him and he nearly starved himself to death, mourning for them. It took much time and love to bring him back to health. He does not handle change and is a very sensitive cat. He is now content as a permanent resident and needs a sponsor. Marvin is 3 1/2 yrs old. 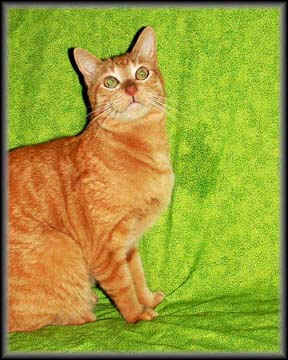 The annual fee to sponsor Marvin is $240.00 which may be paid in a single yearly lump sum, in quarterly payments of $60.00 or in monthly payments of $20.00. In return, you will receive a photo of "your" cat, with a brief history, periodic updates and quarterly newsletter. Also your name will be posted on this page. Print this form and send it along with your contribution.